My kids and I tend to spend most of our summer days at the local pool with friends. I love summer and enjoying the sunshine outside. Sometimes we stay a little longer than we should and we get home and it is already time for dinner. All the staples of this salad are things that are on hand at my house, so I can have dinner ready in a short amount of time for my starving children (swimming all day sure makes for hungry kids). Brown hamburger in large skillet and season with your favorite taco seasoning. Meanwhile wash and dry the lettuce. Once you hamburger is cooked and seasoned; add the ranch style beans (do NOT drain). Stir to combine, and just warm the beans. 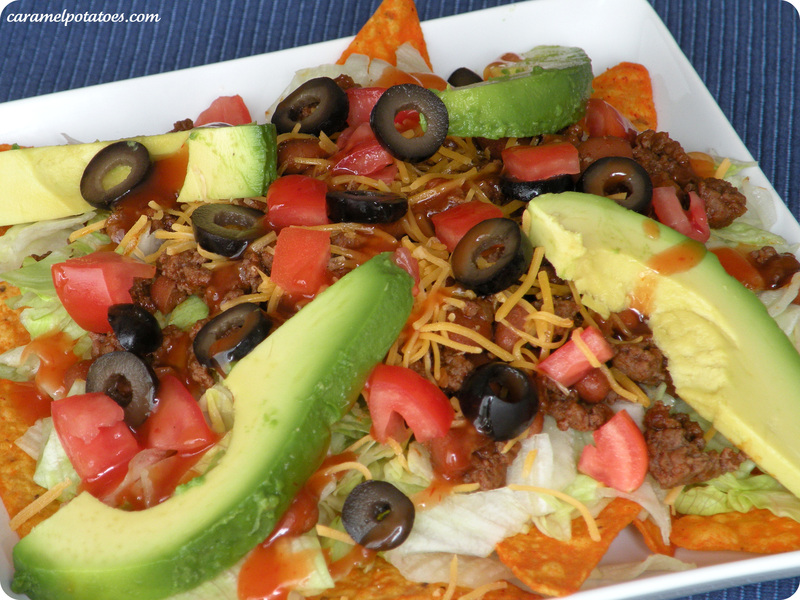 To make the salad we crush chips on our plates and then add lettuce, meat/beans, and other optional toppings. Top with Catalina salad dressing. YUM! Fantastic Morning, I just stopped in to visit your web site and believed I’d say I experienced myself….